Mantra in Palo Alto was a delightful discovery! It would not be accurate to call this Michelin recommended restaurant Indian. Mantra's owner Ashwani Dhawan prefers to call this California Cuisine - with a dash of India. Ashwani and his partner, chef Sachin Chopra, have crafted this unique cuisine which combines California freshness with bold spices and flavors of Indian spices. You enter the restaurant through the Daru lounge and long-bar which serves small plates, cocktails and wine. The restaurant itself is casually elegant, warm, with soft lighting; they also showcase paintings from Indian masters such as MF Hussain and SH Raza in the dining area. We went with Ashwani's recommendations. After the complimentary soup, we began our culinary journey with the Paneer Cuboid: a fenugreek marinated cube of paneer, stuffed with pickled mushroom duxelle, Seviyan crust, Daikon and Lychee salad with roasted pepper coulis. A great combination of flavors! It would be even better if the paneer were a little softer. Then came the Cinnamon Shrimp Lollipops: ginger and green chili spiked shrimp lollipops, served over cucumber, Daikon root, Alfalfa sprouts and Fennel Salad. Very exotic and I enjoyed the flavor of cinnamon with shrimp, but overall I think I liked the Paneer Cuboid better. There were two of us and we shared our entrees. 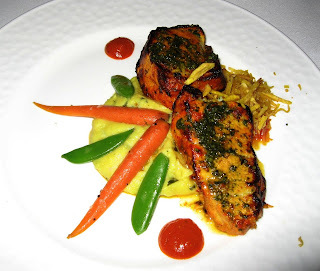 I had ordered their signature entree, the Tandoori Sea Bass with a green chili-cilantro-pasto marinade, on basil eggplant mashed potatoes and garden greens. This was unbelievably awesome! Juicy, flavorful and delicious by any yardstick. This, in my opinion, is the must-have dish in Mantra. 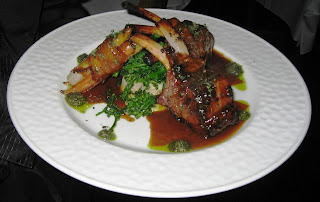 The second entree was the Herbed Lamb Chops: grilled lamb chops, basil mashed potatoes, bacon wrapped vegetables and cream. I loved this one too! We had ordered the lamb chops done medium, but the meat was still juicy, well marinated and tasty. 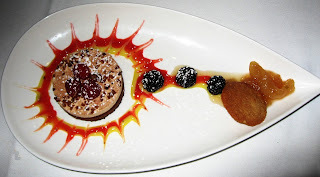 The Passion Fruit Soup with Milk Bombe in Cayenne Expresso chocolate sauce provided a sweet ending to our meal. We had chosen an Italian Prosecco wine with our entree which went rather well too. All in all, a fine dining experience. I particularly enjoyed the entrees and the dessert. wow, looks like a treat...love the presentation. It looks so artistic, I would feel bad to destroy the presentation! @backpakker, sig, zhu: Thanks for visiting and leaving comments. I have never been impressed by California food, it is always over-engineered and quite complicated. 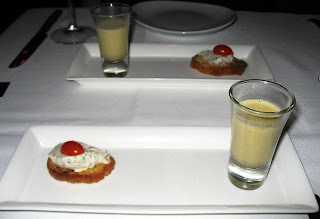 In fact, I have always though Heston Blumenthal of Fat Duck fame could have been Californian!